MAPS newly acquired EA-6B Prowler comes to us on an indefinite loan from the National Museum of the Marine Corps. The Prowler was developed from the A-6 Intruder. Marines deployed with Marine Tactical Electronic Warfare Squadron 2 pose for a group photo on the ramp at Al Udeid Air Base, Qatar, Aug. 16, 2018. Marines with VMAQ-2 are taking part in the final EA-6B Prowler deployment before the final six aircraft in the U.S. military inventory are retired. (U.S. Army photo by Spc. Jose Diaz/Released). Our aircraft, serial #163047 is one of these aircraft. 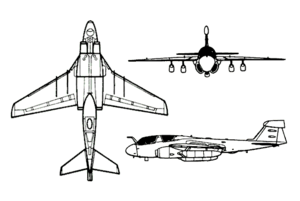 Additional Information on the history of the EA-6B Prowler from Wiki or visit MAPS Air Museum!